Complete kit and instructions to convert a 2 passenger Ford Think to a 4 passenger vehicle. Golf bag holder and basket kit are optional and can be removed when not needed. 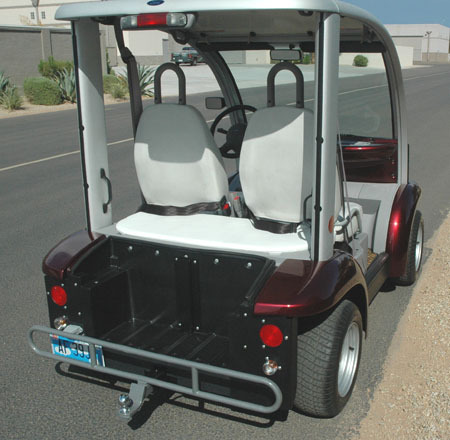 Comes with custom seat, grab handles, seat belts, tail light convesion panels, drawbar bumper with hitch ball, drawbar receiver, license plate light and bracket, hardware and instructions. Well, my 1st mistake was purchasing a 2 seat model Ford Think. Really needed a 4 seat model for the family, so this 2 Passenger Rear Seat Kit from NEV was my only alternative. Sticker-Shock was my first negative feeling...over $750 for this kit, then you still have to pay shipping! Realistically, this kit should be priced at no more than $500 and that is being generous Went ahead, bit the bullet, paid for & ordered the kit. My order was delayed for several days no clue why...called a few times, no help then they finally initiated shipping my way after at least 5 days! Got the parts...with NO INSTALLATION INSTRUCTIONS! Had to call NEV...again...and finally someone e-mailed me the install instructions. Got the kit installed, but I have to tell you that when finished, I was still more than just a little disappointed in how incredibly over-priced the seat kit was...add in the lengthy shipping delay, and no instructions...well, you get the picture. The folks on the phone were nice enough, but a tidbit of advice to the NEV Company...when good, honest customers are paying your company that kind of money for your product or services...ensure that the order is shipped out to them fast, efficient, and is COMPLETE.